Eyelid surgery, also known as a blepharoplasty or an eye lift, is a procedure that removes excess skin from upper eyelids and reduces bagginess on lower eyelids. Usually performed for either cosmetic or vision reasons, this surgery can treat bags under the eyes, folds around the eyes, excess fatty deposits, eye wrinkles and other typical signs of aging around the eyes and eyelids. The best candidates for this procedure are healthy, non-smoking individuals without previous serious eye conditions, who have realistic goals in mind for eyelid surgery. While there are no guarantees with an eye lift and the procedure cannot treat dark circles, fine lines or saggy eyebrows, it can be effective at improving a patient’s appearance and correct vision problems that result from drooping eyelids. Before eyelid surgery, a patient will receive either intravenous sedation or general anesthesia. Once the area has been sufficiently numbed and the patient is comfortable, Dr. Potyondy begins the procedure, which typically takes around two hours total. He makes incision lines around the eyelid area in a way that is designed to minimize future scarring; then, Dr. Potyondy removes or redistributes excess fat and skin, while also tightening muscles as desired. Finally, these incisions get closed up with removable sutures, skin adhesives or surgical tape, and/or lasers may be used to reduce potential discoloration. For many patients, eyelid surgery can result in an improved physical appearance and restored confidence, beginning as soon as the procedure is over. There is typically some swelling and bruising post-surgery, which fades over the following days and weeks, as well as stitches that will remain for up to a week of time. The rejuvenated look typically last for at least five to seven years, although changes will occur as a person ages and skin loses elasticity. 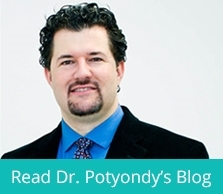 For the best results, patients should follow Dr. Potyondy’s instructions carefully in terms of post-surgical care, medication and resting.